Peaches and Apricots - Do You Know The Muffin Man? 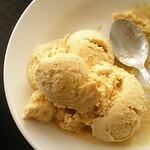 Ice cream: Recipe from Forever Summer by Nigella Lawson. Notes: I made this with all 10% cream so it wasn't very rich. Peaches were very ripe, but since no weight was given, I don't think I used enough, so the flavour wasn't very intense. Pastries: Recipe from Baking with Julia by Dorie Greenspan. 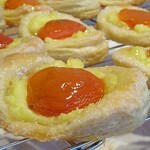 Notes: Combination of flaky pastry, smooth pastry cream and sweet-tart apricots is incredibly yummy. Apricots don't need to be poached for longer than a few minutes, they tend to fall apart otherwise. 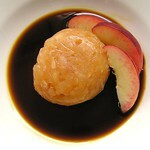 Jelly: Recipe from Shunju: New Japanese Cuisine by Takashi Sugimoto and Marcia Iwatate. Notes: Peaches are grated so the texture is chunky (unlike the photo in the book). I used gelatin powder instead of leaf gelatin, about 5 g. Blackstrap molasses is not a good substitute for palm sugar, the syrup tasted terrible.